Beijing Olympics theme composer Tan Dun hopes revolutionary methods of playing music will emerge when YouTube members perform his work. Video sharing website You Tube is launching a competition to discover new classical musicians. Billed as an online orchestra, the site wants users to submit videos showcasing their musical talent. Users have until 28 January 2009 to submit their entries, with a final public vote taking place two weeks later. The eventual winners will be flown to New York's Carnegie Hall, to play at a three day classical music summit. The contest revolves round a piece - commissioned by You Tube - scored by classical composer Tan Dun, better known for his Grammy and Oscar winning music for the movies Crouching Tiger Hidden Dragon, and Hero. 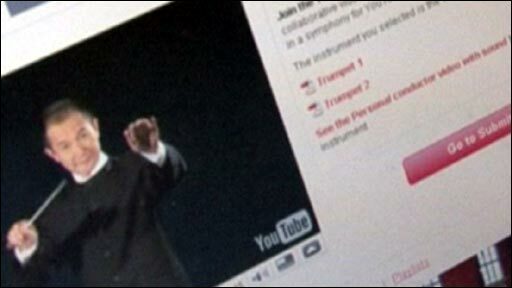 YouTube's Patrick Walker demonstrates the orchestral masterclasses which are available on the video sharing site. 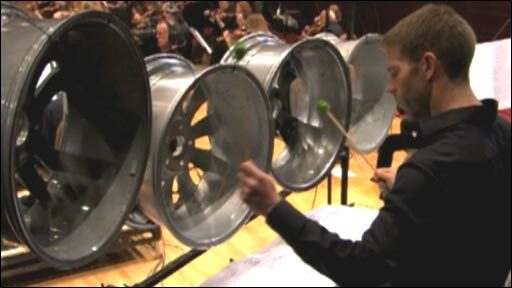 Users have to perform their own interpretation of Tan Dun's composition, which does not necessarily mean using a musical instrument. Talking to the BBC, he said his latest composition was inspired by walking round the streets of New York and hearing the sounds of mechanics. "The internet is an invisible Silk Road, joining people across the world. Anyone can download a score of my Internet Symphony No 1 "Eroica", pick any part of it and play it with any instrument or object, in any style." You can use anything, sticks, metal. Anything can be made to make music or beat a rhythm." "Of course, it has to work not only in a solo environment but accompanying other instruments- that's the challenge," he said. In addition to showcasing their interpretation of Tan Dun's piece, users also have to perform a famous classical piece, with the two video submissions going to a panel of judges, with a shortlist then selected for a public vote. "Through the YouTube Symphony Orchestra project, we will explore new ways for music lovers to create new work and learn from one another," said the projects artistic advisor, the musical director of the San Francisco Symphony, Michael Tilson Thomas. "Music means so much to different people, in different countries. It's not just about the note of music, it's about discovery." The final winners will be flown to New York's Carnegie Hall to play a three day classical music summit with the Michael Tilson Thomas, which will include playing Tan Dun Internet Symphony No 1 "Eroica". "This is a unique opportunity to perform on the world's most famous stage," said Carnegie Hall's executive director Clive Gillinson. "The creation of the YouTube Symphony Orchestra will be a one-of-a-kind moment in classical music, bringing musicians together in a totally new, modern, and compelling way."